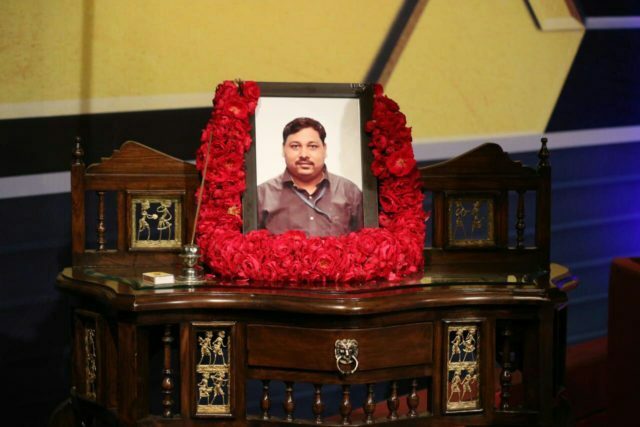 New Delhi: Today a prayer meeting was organised by Ministry of Information & Broadcasting (MIB) and by Prasar Bharti (PB) for the DD video journalist Late Achyutananda Sahu. On 30th of Oct `2018 he was killed in a Maoists attack in Aranpur of Dantewada in Chhattisgarh. He was there to cover the elections. He fell to the bullets sprayed by Left extremists. Achyutananad Sahu (34) was born to Tulasi and Narenendra Sahu, he was the youngest amongst four siblings. His family lived in Ghusuramunda village under Loisingha police station limits in Balangir district of Odisha. He began his career by working as a gram rojgar sevak in Budhipadar panchayat before joining the Indian Army as a clerk. He then took a voluntary retirement from the Indian Army in 2008 to join the BP Film & Television Institute at Cuttack to study cinematography. In 2013, Sahoo joined Doordarshan as a cameraperson and covered several events. His last official coverage was that of Prime Minister Narendra Modi ‘s inauguration of Jharsuguda Airport on 22nd of September ‘2018. To a tweet put out by Union Minister Rajyavardhan Rathore about his participation in this prayer meeting, socio-political leader and Chairman of SNSMT Suparno Satpathy put out a comment tweet on his, thanking Rathore and everyone at MIB/ PB for doing this. In his tweet he also put in a request with the Minister to provide a job to Himanchali Sahu the widow of Acyutananda Sahu. Shri. Satpathy’s tweet was replied to by the Chairman of PB Dr. A Surya Prakash. He replied via a tweet confirming that the Union I&B Minister has announced financial relief and employment to Himanchali. This said prayer meeting was also attended by the Chairman of Prasar Bharti A. Surya Prakash, by Shashi Shekhar CEO Prasar Bharti ,by the Director General of Doordarshan Supriya Sahu and many others.